What do the new polymer banknotes mean for the print industry? Back in September, the Bank of England launched its first polymer banknote, alongside the brand new design of the fiver. 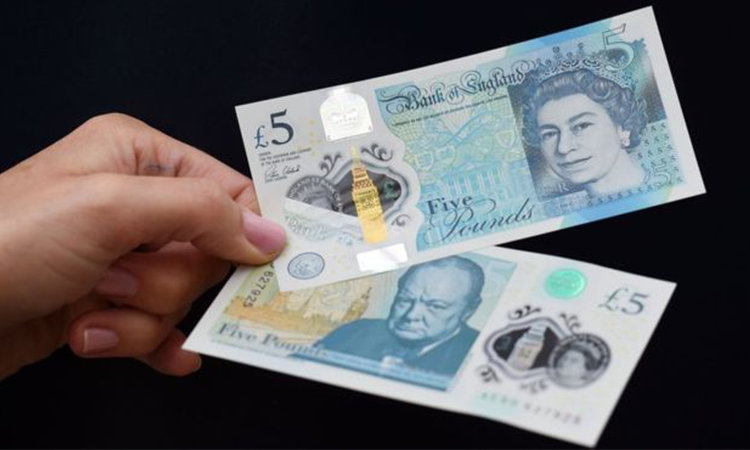 The new £5 note, featuring the image of Sir Winston Churchill, has quickly become common since its introduction, while many of the former paper notes are continuously being withdrawn from circulation. One of the key reasons for the move to polymer was to usher in a wealth of additional security features to banknotes, making them extremely difficult to counterfeit. Banknote forgery has been a long-standing issue facing the printing industry and the central banks. The introduction of the new polymer notes aims to benefit the industry in the long term. To produce this new range of banknotes – as well as other polymer-based notes planned for the future – the Bank of England uses the De La Rue printing facility in Debden. This will see the addition of new designs for the £10 note in late 2017 and the £20 note expected by the year 2020. While the initial cost of polymer banknote production is higher than the older cotton-paper type, their composition means that they’re more durable and resistant to dirt and damage. This reduces the need for repeat printing, keeping costs to a minimum. The environmental impact is also beneficial and contributes toward a cut-down on costings. Even though a composition of plastic replaces natural paper, the energy requirements and production methods are ecologically better. Adding this to the fact that notes are smaller and lighter, transporting large quantities across the country to ATMs and cashiers also uses less energy, ultimately having a better effect on the environment as well as lower costs. All in all, the use of a new innovative material, advanced security features and the manufacturing process should be beneficial to the printing industry.